The public’s views of the quality of the nation’s political discourse – or the lack of it – come from a new survey of opinions about democracy in the United States. 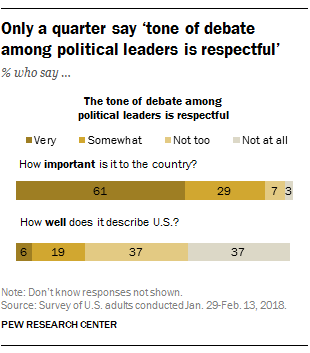 As is the case with a number of ideals and principles related to democracy in the U.S., a majority of Americans (61%) say it is very important that the tone of debate among political leaders is respectful. Yet as with most other ideals, few say this is actually happening. Just 25% say the following statement – “The tone of debate among political leaders is respectful” – describes the country very (6%) or somewhat well (19%). Of the 16 aspects of the political system and democracy asked about in the survey, this rating is among the lowest. The public also has little tolerance for the use of personal insults by politicians, though attitudes are somewhat more mixed about whether people generally are “too easily offended” by the language others use, or whether people need to be more careful to avoid offending others. Among members of both parties, tolerance for political insults had increased modestly over the course of the 2016 campaign. Today, the shares saying that personal insults by politicians are sometimes acceptable are similar to levels in March 2016. Among Republicans, those who describe themselves as conservative (44%) are more likely than moderates and liberals (33%) to say political insults are sometimes fair game. There are no significant ideological differences among Democrats. 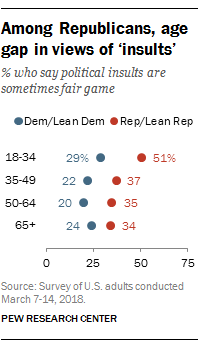 There also is a sizable age gap in views of political insults among Republicans, but not among Democrats. Younger Republicans are more accepting of political insults than older Republicans and Democrats across age categories. About half of Republicans ages 18 to 34 (51%) say political insults are sometimes fair game; among older Republicans, no more than about four-in-ten express this view. Just 29% of 18- to 34-year-old Democrats say political insults are sometimes acceptable. Similar shares of older Democrats hold this view. These attitudes are linked to the degree to which adults prioritize respectful political debate. Among those who say it is very important that the tone of political debate is respectful, attitudes on political correctness are split. Equal shares say too many are easily offended and say people need to be more careful about language to avoid offending others (50% each). Among those who say the tone of political debate is only somewhat, not too or not at all important, a 63% majority say too many people are easily offended.